The most impressive of the pinnacles when viewed from low on the ski area, the Great Pinnacle also holds the classic routes on the ridge, such as Chiming Bells and Grand Gully. From Hut Flat, traverse out to the northeast below the big bluffs on the North West Face, to where straightforward climbing can position you on the ridge. A pleasant scramble follows along the rocky crest to the summit. Most enjoyable. This face has seen much activity. Beginning from Hut Flat it’s possible to do a reasonably straightforward ascent that avoids any major difficulties. Start up the middle of the face, heading up to the narrow left-tending gully that leads through the main section of bluffs. Above the bluffs, head back right, up the snowﬁeld and the summit blocks. A nice mixed pitch up a slab, to the left of where the usual North West Face route climbs the gully through the main bluffs. Other mixed routes also exist on spurs below that gully. Short but quite steep in places, this tackles ice smears up the right side of the Northwest Face gully. The deep gully about 30m left of Chiming Bells. Climb steepening ground up the gully before tackling the ice curtain directly. The curtain rarely forms. 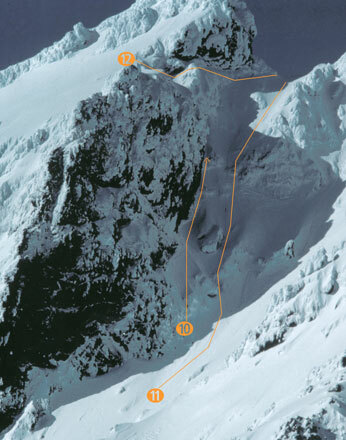 Perhaps the classic ice route on Ruapehu, this climb tackles ice runnels up the western face of the Great Pinnacle. Various options exist on each of the two waterfall pitches. The obvious gully in the centre of the face. Move right up a lower-angled ramp. Climb ice smears at the head of the ramp to the upper snowfield. A steeper line, less often in good condition, starting about 10m right of the Original Line and continuing direct up steep ice, rather than moving right. Begin up the Direct route, and climb up to the left end of the snow ramp. Traverse left a few metres and then up a vague rib (about 25 metres). Only really climbable in good ice years. A final pitch to the snowfield keeps well left (north) of the Direct Variant. From the bottom of Grand Gully climb the couloir that tops out below the first pitches of Chiming Bells. Best climbed as an alternative start to that route. The main drainage line tucked away on Grand Gully’s left (northern) side, with two steep sections. Stay hard against the left wall of Grand Gully, up to the start of Gorilla. The major feature when viewed from Whakapapa skiﬁeld, running directly from the valley ﬂoor to the col south of Great Pinnacle. The gully narrows and climbs some short steeper steps towards the top. Avalanches are a serious hazard in winter after snowfall. From the col at the top of Grand Gully, the Great Pinnacle is an intimidating prospect. The next two rouites describe two methods of reaching the summit. 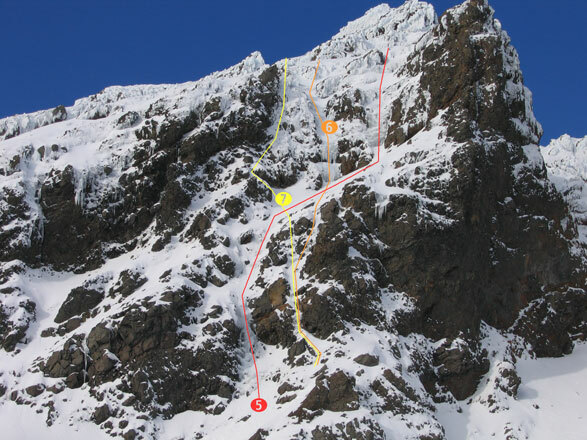 From the col, follow ledges across the face facing the skiﬁeld to reach the top of the Northwest Face. Exposed, but not difficult. Climb direct from the col. In winter conditions, an alternative is to drop down about 15m to the east into the start of a gully. You can traverse into the gully from the col, but starting lower makes a better, more sustained route. Climb back up the gully and then mixed ground to the top.